Today we are comparing the Alexander Hybrid vs Helix Luxe which is also a hybrid mattress that uses coils. Both of these models come with free shipping to your door. Both mattresses come with different firmness options. The Alexander Hybrid by Nest Bedding offers three different options. While the Helix Luxe doubles that with 6 various firmness levels for even more perfected comfort. With both mattresses excelling in durable edge support as well as minimal motion transfer, you may be wondering which option is right for your home. Below we go over all the important information to help you decide which mattress is the best. 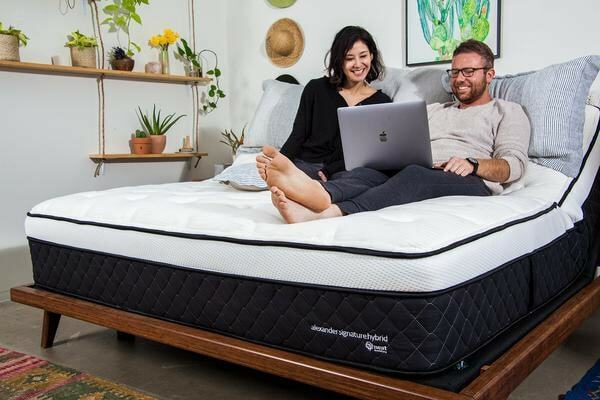 Keep reading our Alexander Hybrid vs Helix Luxe mattress comparison and don’t forget to save on either with our coupons too! 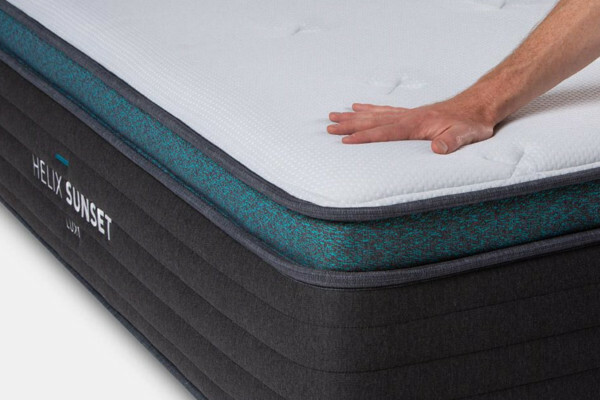 Nest Bedding offers a variety of thicker profiled well made mattresses. With not only a variety of beds, as well as bedding products, but several years of experience really helps make this established company easy to buy from. 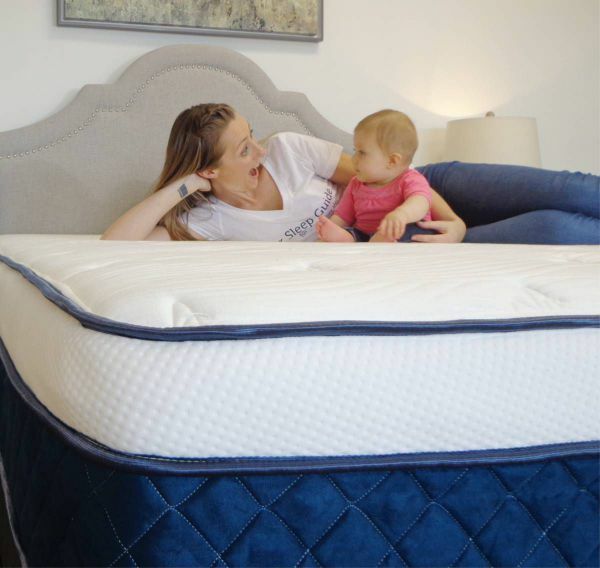 With each of their mattresses, including the Alexander Hybrid, you get solid customer service and a lifetime warranty. Guaranteeing your purchase for the life of your mattress. Making this a great company to work with. The Alexander Hybrid is a very thick and durable mattress that is an ideal hybrid build. This mattress comes in a soft, medium, and firm option. Making the Alexander Hybrid a great choice for someone who needs a little more variety when choosing a mattress. The Alexander Hybrid features both coil and foam layers that target cool sleeping. It also has a reliable and solid amount of edge support along with a reasonable price point that will get the attention of anyone looking for a great deal. Jump to the full Alexander Hybrid review. Or get the latest pricing and shop at NestBedding.com. Alexander Hybrid by Nest Bedding Coupon: Latest Savings Found HERE! Helix Sleep first came to the “bed in a box” market with a custom approach. Offering a more personalized style of mattress to suite customers specific needs. After years of perfecting their concept and understanding what sleepers need they were able to not only revamp their original Helix mattress, but also offer a premium hybrid too, the Helix Luxe. This upgraded option is not only more luxurious but also offers amplified benefits too. The Helix Luxe is available in 6 different firmness options. Each of these six options focuses on support geared towards your size. As well as your firmness preference too. Making for a soft, medium and firm mattress in varying support levels. This super thick mattress comes with little to no off-gassing and ships to your home for free. You also won’t have a problem with any motion transfer or a lack of edge support if you choose to go with the Helix Luxe. Jump to the Helix Luxe Review! Or get the latest pricing at HelixSleep.com. Helix Luxe Coupon: Latest Savings Found HERE! 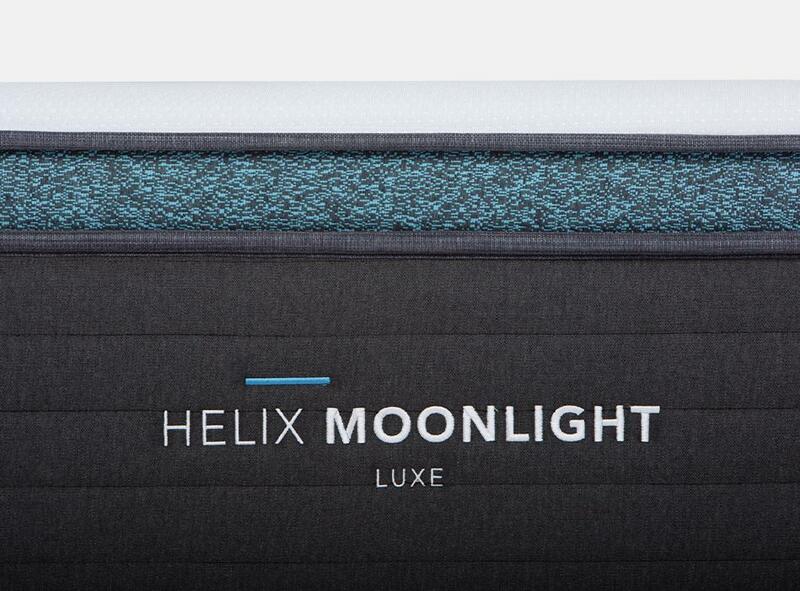 The Helix Luxe like most mattresses ships to your home completely for free. The company simply puts your choice of Helix Luxe mattress into the mail truck from there warehouse. 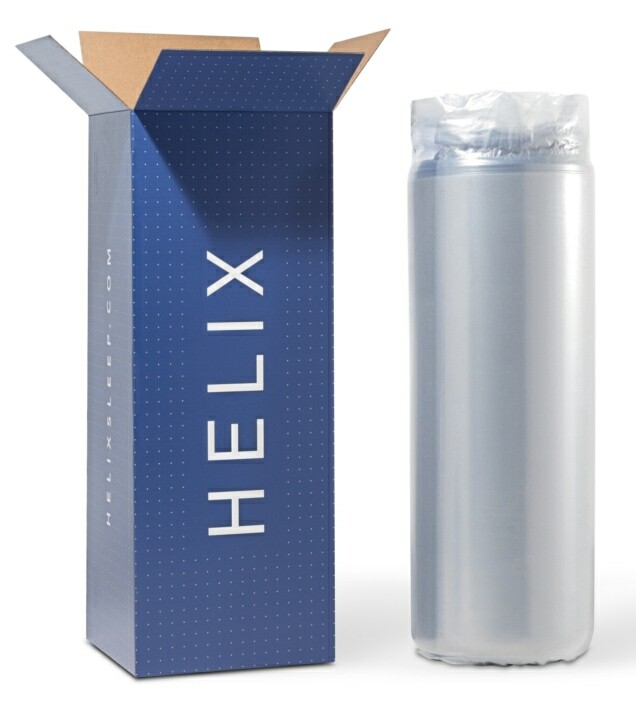 The Helix won’t have you sign any papers in order to receive the products, so you don’t have to worry about coming home from work early to get your package. The Helix Luxe should get to your home in about a week after you place your order. Once it arrives you just have to unbox it and begin the set-up process. The Alexander Hybrid comes with free shipping as well. The mattress will ship straight from a warehouse located in the USA to your home. The Alexander Hybrid arrives rather fast and usually within a few days of you placing your order. The box is a little awkward to move on its own so you may want to enlist some help when you go to bring it into your home. Like most mattresses, you simply need to open the box and remove the plastic to begin the unboxing process for your new mattress. Both the Helix Luxe and the Alexander Hybrid will have a small bit of off-gassing. You may even find the off-gassing smell of the Alexander to be a little bit off-putting. If this is a case simply open a window and let the mattress air out in an open room for around 12-hours. You can do this during the 12 to 24 hour period that you let your mattress in. After this, the mattress will be ready to sleep on. Keep in mind that it will take a few additional nights for these products to gain their full firmness back. Both the Alexander Hybrid and the Helix Luxe use a combination of both foam and coils to create their various firmness options. The Alexander Hybrid mattress has a huge focus on using materials that sleep cool. The Helix Luxe feels more varied with its layers to create an equal balance of cooling and comfort. The mattresses do both have different firmness options to choose from with the Helix Luxe having the most options. Changing firmness options will make the materials used in the mattresses vary slightly. 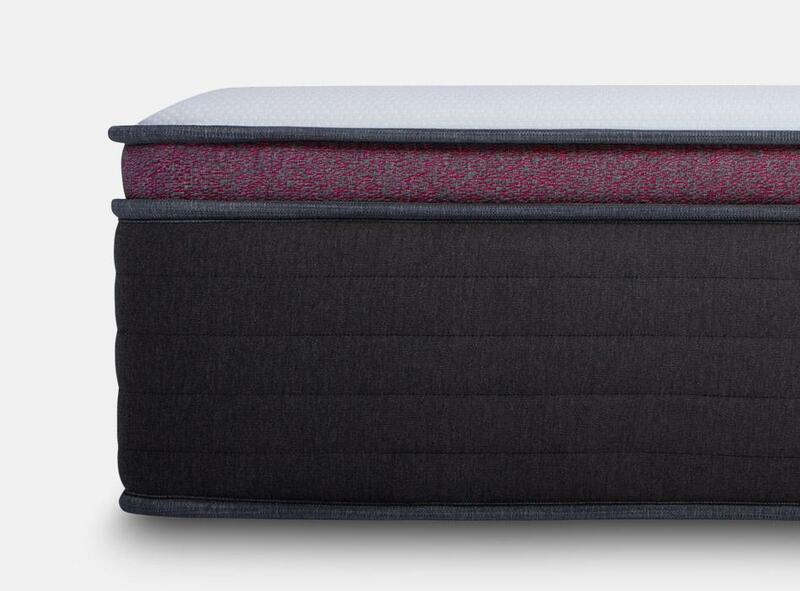 The Alexander Hybrid is a 13 plus inch mattress with 5 different layers of foam and coil. The first layer is 1.5-inches of gel infused memory foam along with the super soft quilted thermic phase-changing fabric. This layers targets to keep you cool while providing you with additional comfort. The second layer of the Alexander Hybrid is made up of 1.5-inches of titanium evercool foam. This layer also helps provide cooling aspects to combat the heat retaining properties of foam. The third layer of the Alexander Hybrid is made of 1.5-inches of 4.5-pound slow recovery memory foam. This foam helps you be able to easily change positions during the night. The next layer is an inches of 3 pounds of smartflow support foam. The last layer of the Alexander Hybrid mattress is the support layer. This layer is made up of 8-inches of quantum edge pocketed support coils. This layer gives the bed a majority of its support while providing plenty of edge support for the mattress. 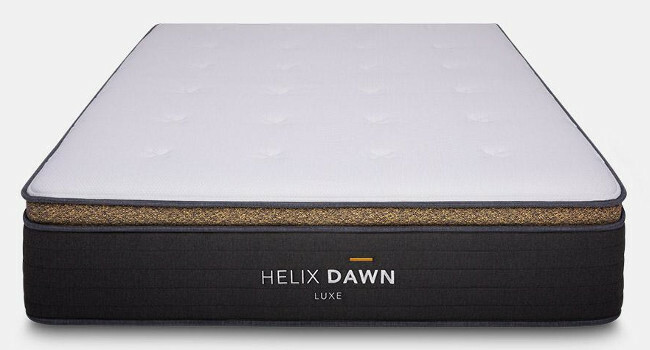 The Helix Luxe mattress is a 14-inch thick mattress made up of 6 different layers. The first layer of the Luxe is the premium pillow-top cover. This cover helps give you a plushy feeling while absorbing any excess heat by using phase changing technology. The next layer of the Luxe is the visco comfort layer. This is a comfort layer that provides you with pressure relief. The third layer of the mattress is a layer of memory plus foam. This layer helps provide you with support while giving the bed extra cushioning. The fourth layer of the Helix is a transition layer. This is made of high-grade polymer foam and separates the softer foam layers from the coil layer. This layer contours to your body while providing even more support to the bed. The Helix Coil layer is next to last and made up of 1,000 different wrapped coils. These coils provide lumbar support and help align your spine while your resting. This layer also shapes to your body for additional comfort. Lastly, we have our support layer made of dura dense foam. This foam gives the mattress additional durability while providing the core support for the bed. The Alexander Hybrid comes in three different firmness option to choose from soft, medium, and firm. The first of these options is, of course, the soft option. This option hits at around a 3.5 out of 10 on the firmness scale. This makes this option perfect for any back or side sleeper who likes to sink into their mattress while they sleep. The next option is the medium-firm Alexander Hybrid mattress. This option hits at around a 5 out of ten on the firmness scale. This option is perfect for all types of sleepers and is neither too soft or to firm. The firm option of the Alexander Hybrid mattress is an 8 out of 10 on the firmness scale. This will be best for stomach sleepers or back sleepers looking for more support. This option is also great for those who hate to sink into the bed or heavier sleepers. The coil system of the Alexander does well at supporting you no matter where your laying and the bed puts a huge focus on keeping you cool during the night. The Helix Luxe mattress comes in an insane 6 different comfort options to choose from. With these Helix really wants to provide a mattress that will fit with every type of sleeper. Each of these mattresses has slightly varying materials and firmness levels. The first of these are the softer choices, the Helix Luxe Sunset and Moonlight. The Sunset is the softest option for the Luxe and has support geared towards more average sized individuals. While the Moonlight is a soft option with slightly denser support for sleepers a bit on the heavier side. The moonlight would also work well for average size sleepers who want a more medium-soft feel too. These two mattresses are perfect for the side and back sleepers out there. The next pair of options are the medium feeling options, the Midnight and Dusk. The Midnight is the most popular option and is a medium feel of comfort with an average amount of support. While the Dusk has firmer support and is a great medium feel for larger sleepers and more of a medium-firm feel for average size sleepers. These mattress options are ideal for back and combination sleepers. The firmest pair of options are the Helix Luxe Twilight and Dawn. Again the Twilight will offer the average support creating a medium-firm to firm feel for average size sleepers. And the Dawn offers enhanced support for a medium-firm feel for heavier sleepers. As well as a very firm feel for average size sleepers. Making for wo options great for stomach and back sleepers who like a firm feel. Each of these mattresses will slightly vary in foam density to work perfectly for each firmness level. But they will all have the same amount of layers and ideal support system of coils. 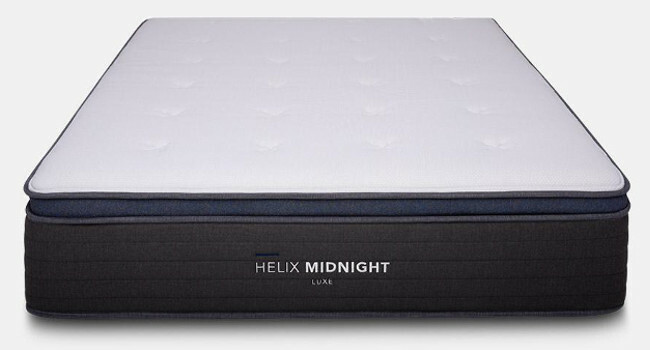 The Helix Luxe line also comes with plenty of edge support and keeps you cool as you sleep. The bed also does a wonderful job at managing motion transfer making it a perfect bed for sharing. Motion transfer can be a much bigger problem than it sounds. Motion transfer can be the culprit that makes many who share a bed normally end up sleeping in separate rooms. This is because many couples are either on a different sleep schedule or one partner tends to toss and turn in their sleep. To help combat this many mattress companies started using materials that stopped motion transfer in its tracks. Both the Alexander Hybrid mattress and the Helix Luxe mattress use foam and coils, both materials that help to stop motion from transferring to your partner. Temperature regulation can be a huge factor in just how comfortable you sleep every night. A majority of people won’t be able to go to sleep in an environment that runs too hot. It doesn’t help any that most mattresses are now made of foam a material that likes to naturally retain heat. To help with this mattress companies use a variety of resources to help keep there layers cool while you sleep. Luckily, both of these mattress companies have taken note of this and have put in technology to make the Alexander Hybrid and Helix Luxe sleep neutral during the night. The Alexander Hybrid has a huge focus on cooling in just about every layer. The Alexander even has thematic phase changing materials in its top layer to keep the surface cool. This layer is also infused with copper a naturally cool material. The Helix Luxe also does a pretty great job at keeping itself cool. The Helix Luxe is designed to negate heat retention and comes with an included cooling cover. Additionally, both of these mattresses have a coil layer that naturally lets air flow through it. You may not think much of the word edge support, but the truth is that edge support is one of the most important features your new mattress can have. This is because a bed without edge support will cause you to sleep more towards the middle. When you try to sleep close to the edge of the bed, you will find yourself slowly sliding towards the floor. If a bed is made with a proper amount of edge support though, then you will be able to use every inch of that mattress for sleeping including the literal edge of the bed. When it comes to edge support most modern day mattresses do a pretty decent job at making their sleep surface evenly supportive from edge to edge. The Alexnder Hybrid has built-in edge support that helps create the same amount of support along every inch of the bed. The Helix Luxe features best in class edge support. This means that the mattress is made to be more supportive than many other products on the market. You should also keep in mind that if you want to sit on the edge of the bed, only the firmer options will be able to support you for extended edge sitting. Both the Alexander Hybrid and the Helix Luxe will come to your house delivered for free. Both mattresses also offer a variety of firmness options to choose from with the Helix winning out with three more options than the Alexander. The Alexander Hybrid is the cheaper of the two mattresses, but not by an insane amount of money. Both mattresses come with a generous warranty with Alexander having a limited lifetime and the Helix Luxe comes with a 15-year warranty to cover you. The Alexander Hybrid by Nest Bedding is priced at $1199 for the most popular size, the queen. This mattress also offers a coupon that makes it even more affordable. Giving you a thick and well made hybrid mattress with contouring memory foam over a supportive coil system. Delivering on ample benefits at an affordable price. 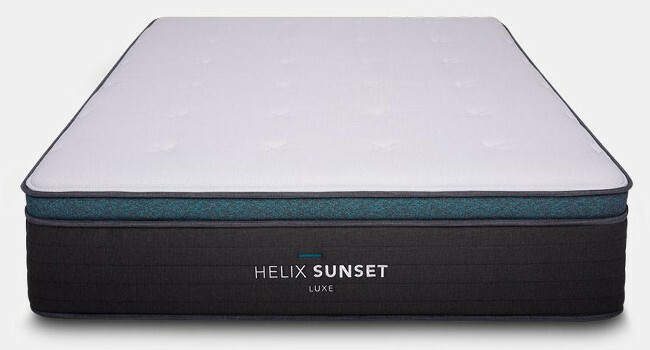 The Helix Luxe is the premium thicker upgrade to the original Helix mattress that also has a slightly higher price tag too. The most popular size, the queen, comes in at $1695. However, this doesn’t include their latest coupon that will surely make the price even more appealing. With the array of comfort and support options you will certainly find the perfect feel for you. And if you aren’t sure you can even take a quiz before purchasing to make sure you are getting the best option for you. Interested in the Helix Luxe? Learn more, take the quiz and shop at HelixSleep.com. As the online market grows many consumers are taking to buying their products online. To help with this growing trend mattress companies now offer sleep trial warranties to their customers who buy a mattress with them. Both the Alexander Hybrid and the Helix Luxe mattresses come with a sleep trial and free returns if things just don’t work out. The Alexander Hybrids trial is 100-nights long. The Helix Luxes trial is also 100-nights long, putting the mattresses on equaling footing. If at any point you don’t feel like your choice is working out simply contact the company to get your free return process started. When it comes down to it, both the Alexander Hybrid mattress and the Helix Luxe mattress aren’t bad picks for your bedroom. They both have free shipping to your door and have a bit of off-gassing to them. The Alexander does seem to have a little bit more off-gassing out of the two though. The mattresses both feature a 100-night sleep trial as well. These mattresses also are both hybrids using a combination of foam with a coil layer to create their feel. You can also enjoy sleeping with your partner in with both brands as they have little to no motion transfer. There are quite a few differences between the Alexander Hybrid vs Helix Luxe. For starters, Alexander has a longer warranty and is the cheaper of the two. The catch is that the warranty for the Alexander is limited and the materials used in the layers are less premium than those used in the Helix Luxe. The Alexander also has top of the line edge support and more firmness choices than the Alexander Hybrid. The Alexander Hybrid comes in 3 different firmness options while the Helix Luxe comes in a total of 6 different options. Still unsure? Check out the FULL review of the Alexander Hybrid or the Helix Luxe Review! For more comparisons reviews beyond the Alexander Hybrid vs Helix Luxe mattresses make sure you check out our Mattress Comparison Page. This will give you access to all our comparison reviews. Including some of our most popular including the Puffy vs Purple, Casper Wave vs Puffy Lux, Nolah Original vs Nolah Signature and Puffy vs Puffy Lux.